I stopped collecting Transformers a pretty long time ago…they were a staple part of my childhood, but eventually I grew out of it and started in on Gundam. 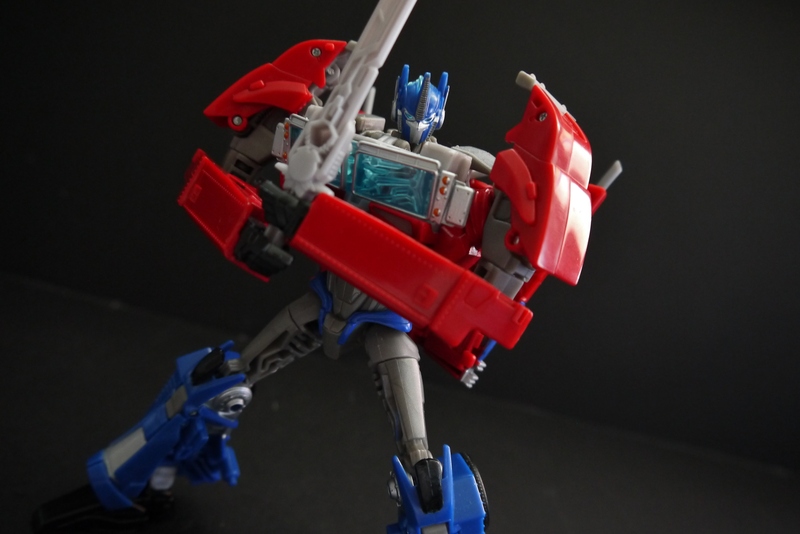 About a year or two ago, however, Transformers Prime came out. I was curious as to how the ‘ol series was doing, so I watched an episode or two and instantly got drawn in. I loved the series, so out of curiosity one day I made a trip to Wal-Mart to see how the modern toys are. The figure is actually a custom, by yours truly. 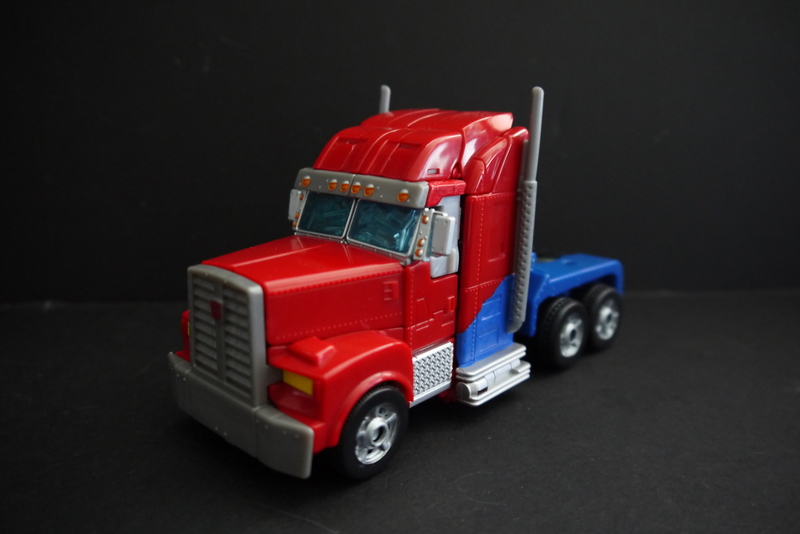 The original Optimus, out of the box, had so many color discrepancies with his in-show self that it hurt. 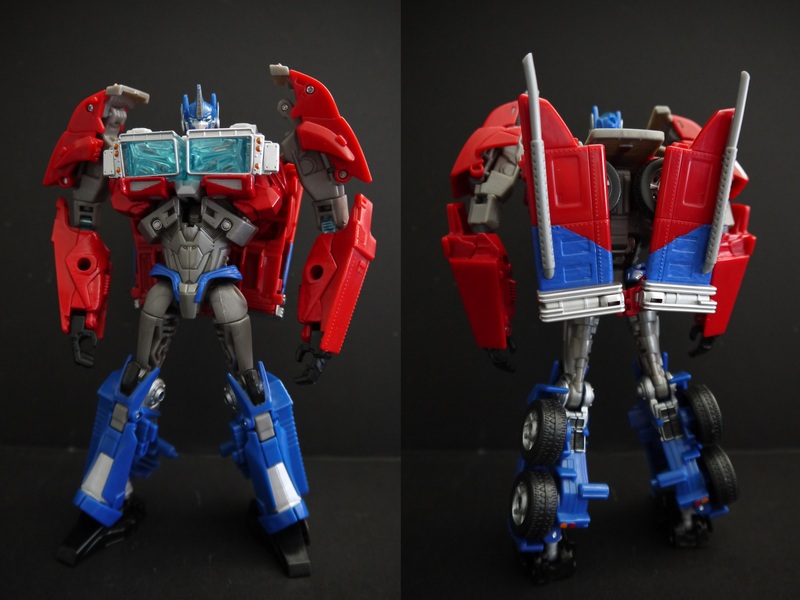 I just went ahead and made some color corrections with paint to make it more like the First Edition figure. As far as the figure itself, it’s not too bad. 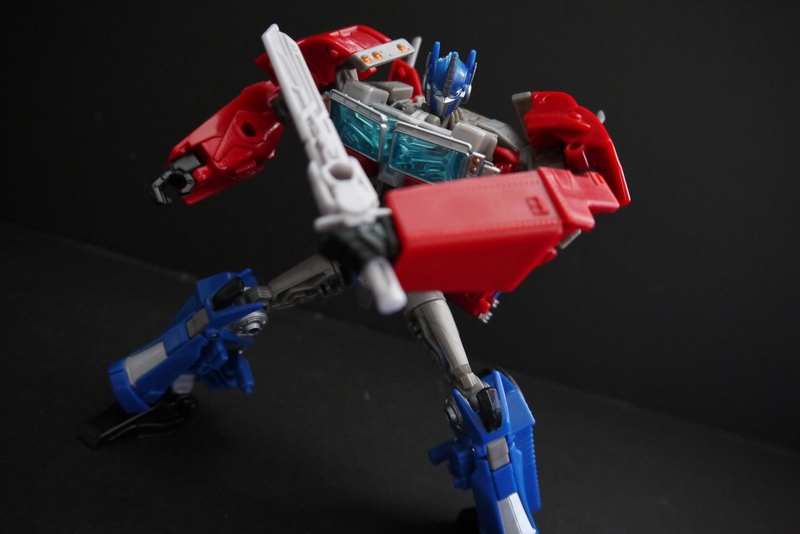 I like how nowadays the figures have a much more free range of movement; I remember the old Armada toys only had articulation where they transformed, and couldn’t really do more than the linear standing poses in robot mode. 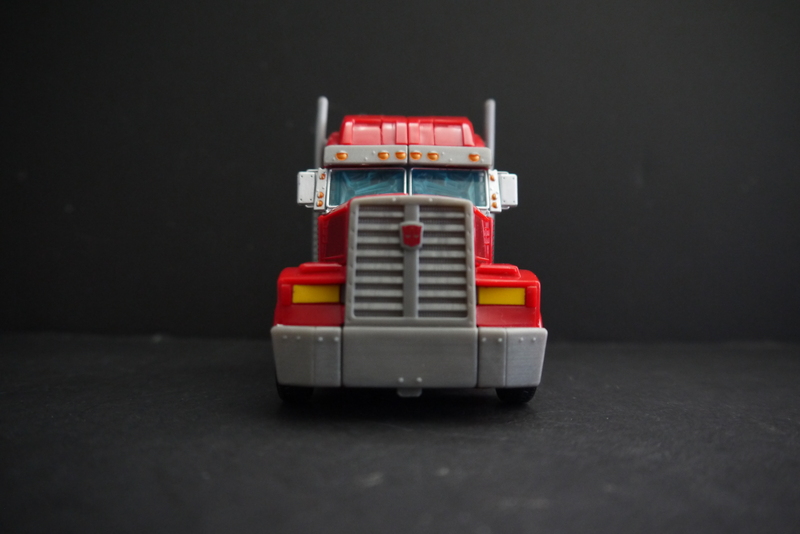 It seems the newer Transformers toys are designed with both robot mode articulation and vehicle mode accuracy in mind. 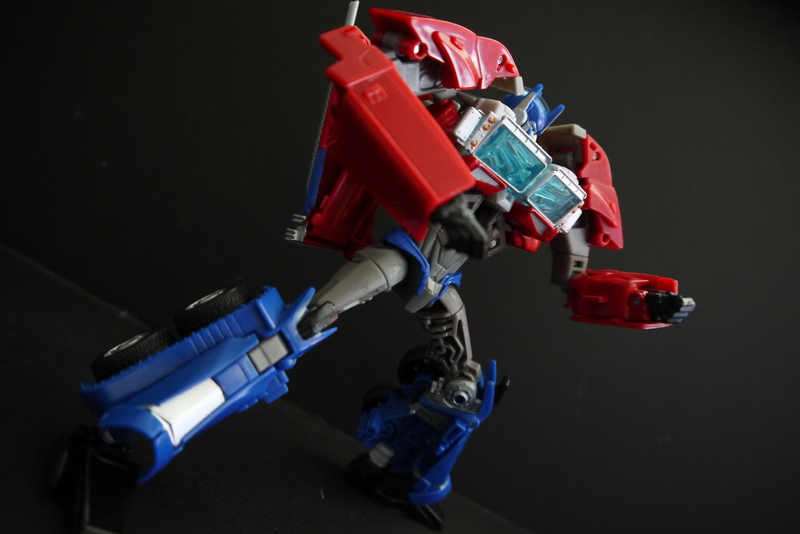 Prime has a very nice range of movement. Kicking is no problem. Balance is very nice. I dislike how the molding is half-assed for some areas though. The inner thighs are hollow, making them an eyesore. 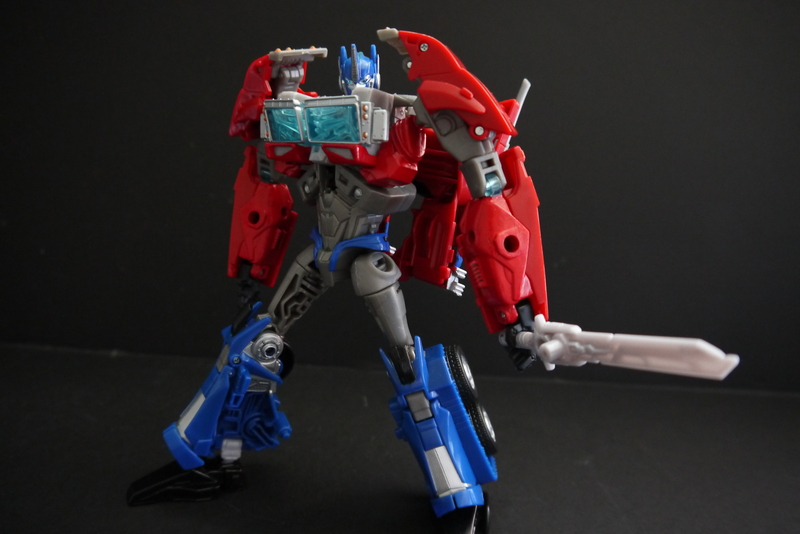 Prime comes with two weapons originally. Both aren’t accurate to the show. The gun was originally an ugly amalgamation of plastic that only vaguely resembled a weapon. It had some light-up gimmick that was entirely useless and hardly functioned. I tried salvaging it by taking it apart and possibly bashing it together to something that could be removable from the arm, but it didn’t work out so well…in the end I just scrapped the entire thing. The sword…is disappointing to say the least. 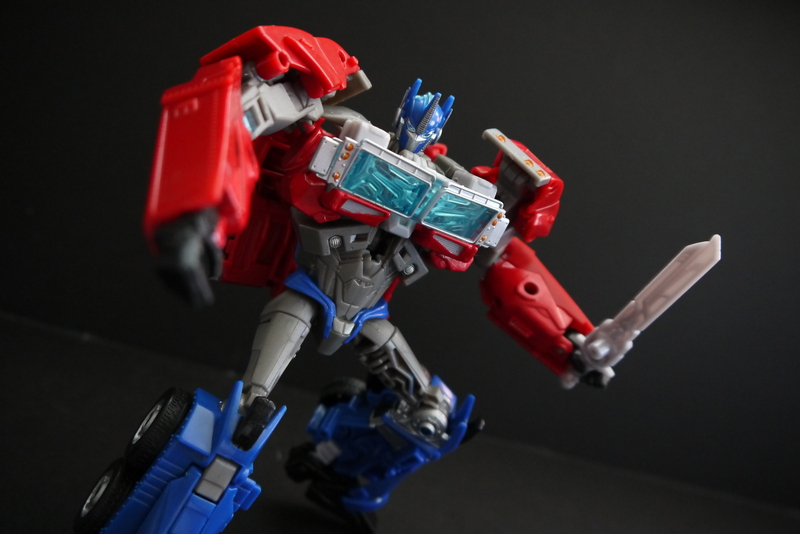 It’s supposed to come out of his forearm, but Hasbro decided that meant having it as a handheld weapon. I don’t even. In the end I was too lazy to do anything to modify it or paint it in any way, so I just rolled with it. I could’ve added some neon blue tinges but meh. Too much effort, not enough return. 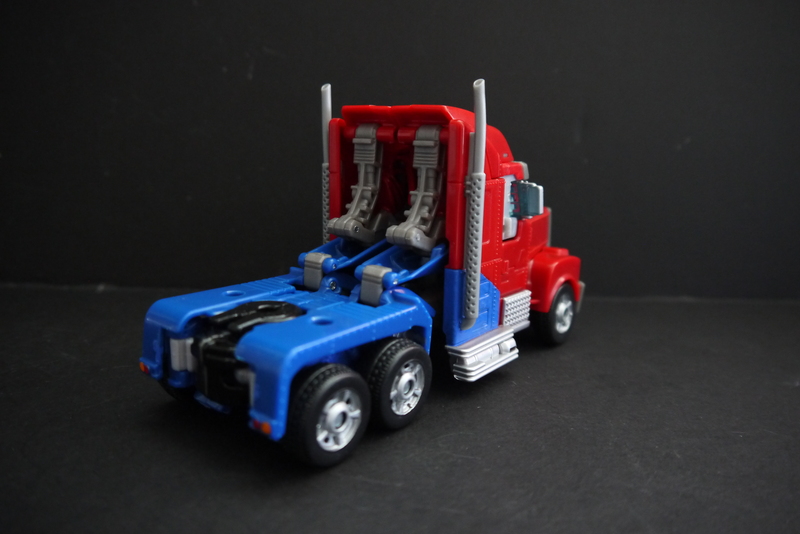 The truck mode isn’t too bad, at least now it isn’t. It was very bland originally, and had quite a few quirks I went on to correct. 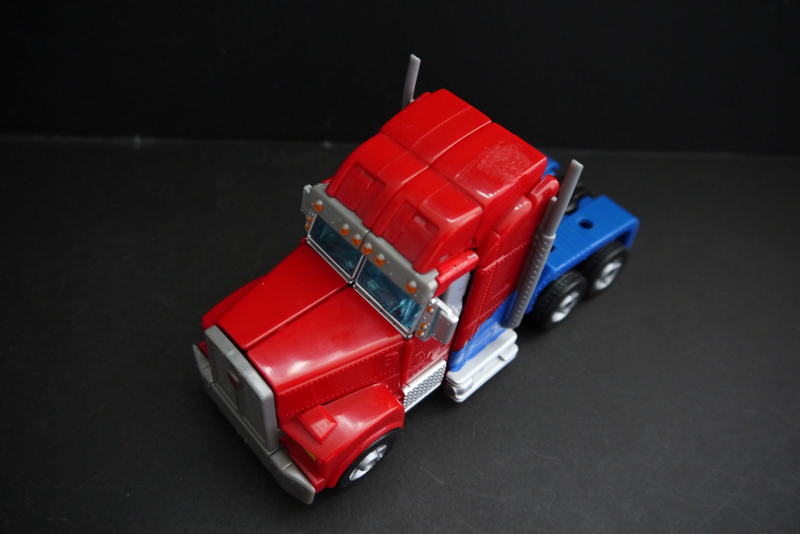 I mentioned before how I painted the cab and rear lights, as well as the iconic blue slant on the sides of the truck. Wheels were also originally all a bland black; had to fill them in with silver to make it look presentable. 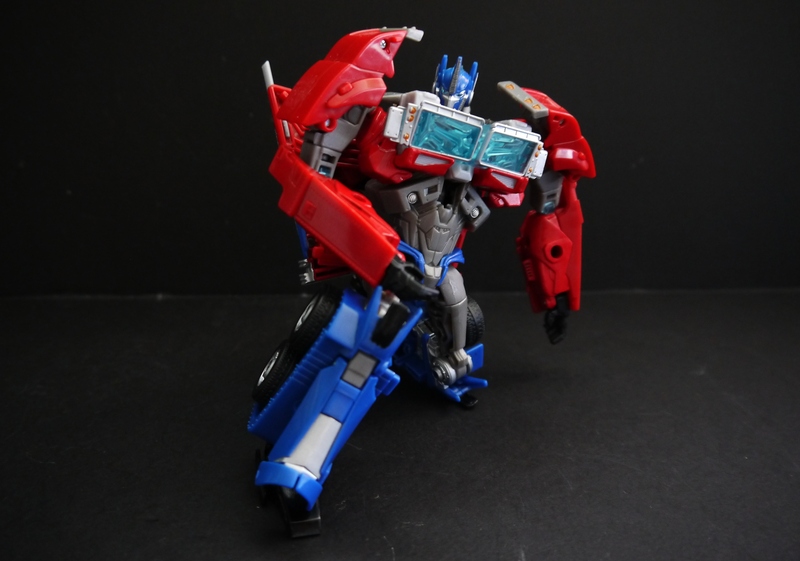 Another thing to note is that one of Prime’s Autobot insignias is located on the roof of his cabin, which ends up forming his shoulder in biped mode. 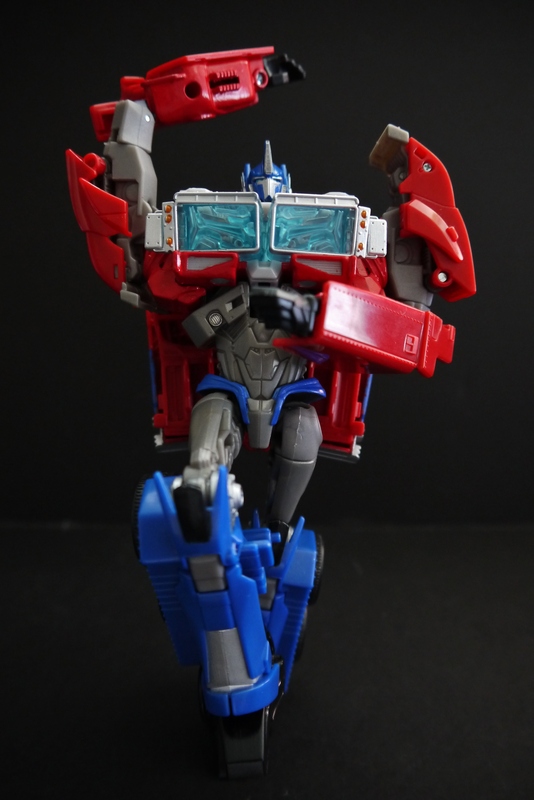 While I see the logic in placing the insignia there, as in-show Prime has two insignias on his shoulders, the actual figure only sports one on the right shoulder, and it was too large and off-center. Naturally this bothered me to a painful degree, so I figured it was better to not have it at all rather than have something that looked ugly. Using an exacto-knife, I scratched it off. It leaves some slight tarnish on the plastic surface, but overall it looks presentable. I love these compact and simple vehicle forms. The big and flashy things with parts flying everywhere just aren’t my style.. In the end, I can’t say this figure was worth the roughly $20 I dropped on it. It’s likely no longer in stores, or at the very least scarce if so. 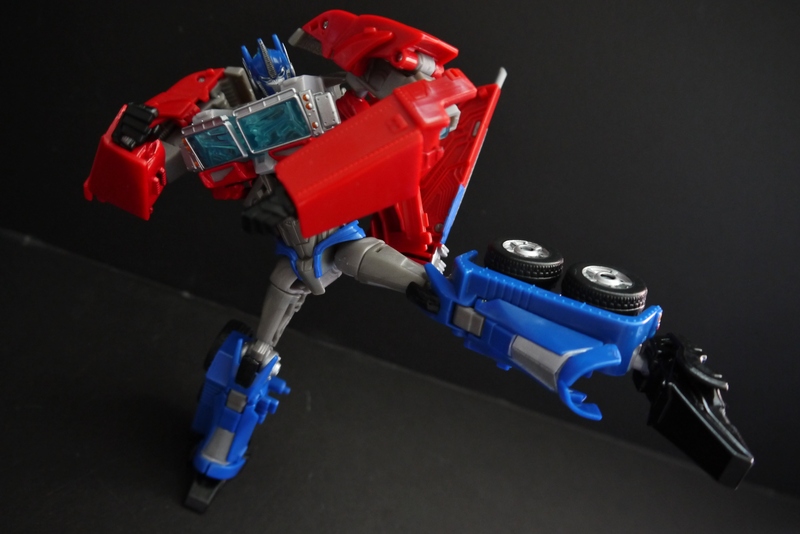 I’ve ended up selling this figure ever since, but I think it’s my stickler for show-accuracy that had me kind of disappointed in this Prime. The lack of at least color-accuracy to the series for a figure of this size and price is off-putting to say the least.